The Proton rocket and its Breeze M upper stage will send Orbital ATK’s Mission Extension Vehicle toward geosynchronous orbit, a ring of satellites stationed more than 22,000 miles (nearly 36,000 kilometers) over Earth’s equator, where an object’s speed is the same as Earth’s rotation, allowing a satellite to hover over the same spot throughout its mission. Orbital ATK and International Launch Services, the U.S.-based company charged with marketing Proton launches on the commercial market, announced the contract Tuesday. The Mission Extension Vehicle will dock with multiple aging Intelsat communications satellites running low on fuel, keeping the telecom stations pointed correctly and potentially pushing the spacecraft into new positions to cover different regions. Intelsat and Orbital ATK, through its wholly-owned subsidiary Space Logistics LLC, unveiled the landmark satellite servicing agreement in April. It is the closest a commercial satellite life extension service has come to launching, and Orbital ATK chief executive David Thompson has said he is committed to the concept, which officials said was bolstered by the merger of Orbital Sciences Corp. and ATK in early 2015. The first Mission Extension Vehicle, named MEV 1, will blast off in the fourth quarter of 2018 on a Proton rocket from the Baikonur Cosmodrome in Kazakhstan. The Eutelsat 5 West B satellite, also manufactured by Orbital ATK, will be stacked on top of the MEV 1 spacecraft for the first all-commercial dual-payload launch by an ILS Proton. After multiple main engine firings, the Proton’s Breeze M upper stage will drop off MEV 1 and Eutelsat 5 West B in a preliminary geosynchronous transfer orbit. Each satellite’s own propulsion system will do the rest of the work to circularize their orbits at an altitude of around 22,000 miles. ILS, Eutelsat and Orbital ATK announced the Eutelsat 5 West B agreement this week in conjunction with the MEV 1 launch contract. The satellite is based on Orbital ATK’s GEOStar platform and should weigh more than 6,000 pounds — about 3 metric tons — at the time of launch. Airbus Defense and Space will supply Eutelsat 5 West B’s communications payload to serve video markets in Europe and North Africa, replacing the Eutelsat 5 West A satellite launched in 2002. 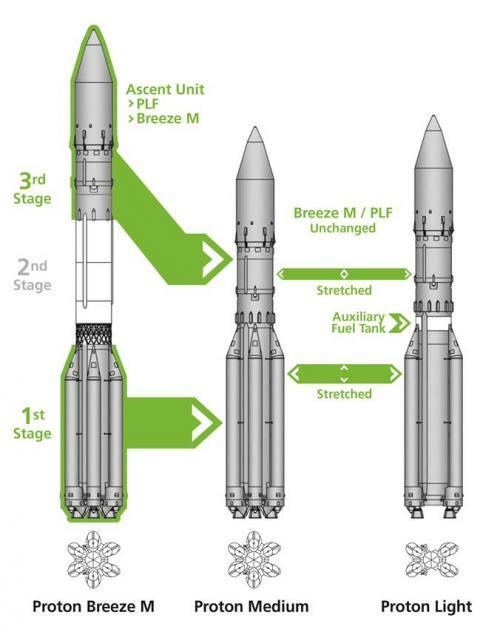 Eutelsat also agreed to be the first customer for the new Proton Medium vehicle, a lighter variant of the Proton/Breeze M that eliminates the second stage of the Proton booster, with the third stage bolted directly on top of the first stage. ILS revealed two new Proton configurations, the Proton Medium and the smaller Proton Light, last month. The Proton Medium variant can place a payload of around 11,000 pounds (5 metric tons) into a standard geostationary transfer orbit. Eutelsat did not identify the satellite for the Proton Medium mission, which is scheduled for the 2019-2020 timeframe. 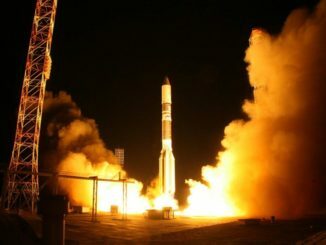 The two Proton launches with Eutelsat payloads are the second and third firm contracts the Paris-based operator has signed with ILS as part of a multi-launch agreement finalized in 2015. The multi-launch arrangement covers Eutelsat launches on ILS Proton rockets from 2016 through 2023, and the first mission under the agreement’s umbrella was successfully accomplished with the launch of Eutelsat 9B in January 2016. Eutelsat officials said the procurement of Eutelsat 5 West B, a smaller satellite than most of the company’s orbiting telecom platforms, and the purchase of a dual-payload launch and a cheaper Proton Medium for a future mission is in line with the operator’s strategy to reduce capital expenditures. The company reduced its spending plans after downgrading its revenue forecasts in May, an announcement that precipitated a major drop in Eutelsat’s stock prices. The MEV 1 spacecraft mounted in the lower position on the 2018 dual-launch will have a launch weight around 4,400 pounds, or 2 metric tons, with about half that mass made up of gaseous and liquid propellants for the satellite’s electric propulsion pods and conventional chemical thrusters. Intelsat has agreed to use the MEV 1 spacecraft for five years in an agreement that allows the servicing tug to dock with multiple Intelsat satellites. The Mission Extension Vehicle idea comes from ATK, which established a joint company in 2010 named ViviSat with U.S. Space LLC, a financing shop. While ATK performed ground tests for the satellite servicing concept, ViviSat never took off, and Orbital ATK opted to shutter the company earlier this year after deciding to pursue the Mission Extension Vehicle idea on its own. But U.S. Space filed a lawsuit against Orbital ATK in April, alleging that Orbital ATK improperly took control of ViviSat and shut it down after the merger between Orbital Sciences and ATK. Orbital ATK officials say the merger opened new opportunities for the satellite servicing system, allowing engineers to combine expertise to make the MEV closer to reality. 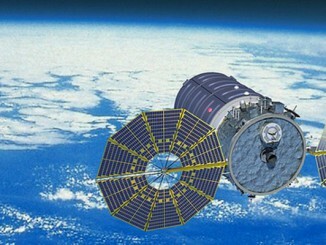 For example, the MEV 1 mission will relay on satellite components already proven in space, such as Orbital Sciences’ GEOStar satellite bus and autonomous rendezvous and tracking instruments flown on the Cygnus space station cargo ship and the U.S. Air Force’s Geosynchronous Space Situational Awareness Program, or GSSAP, a fleet of four Orbital ATK-built satellites designed to track and inspect other spacecraft more than 20,000 miles up. The MEV also uses a docking structure based on devices developed by ATK for space shuttle servicing flights to the Hubble Space Telescope. 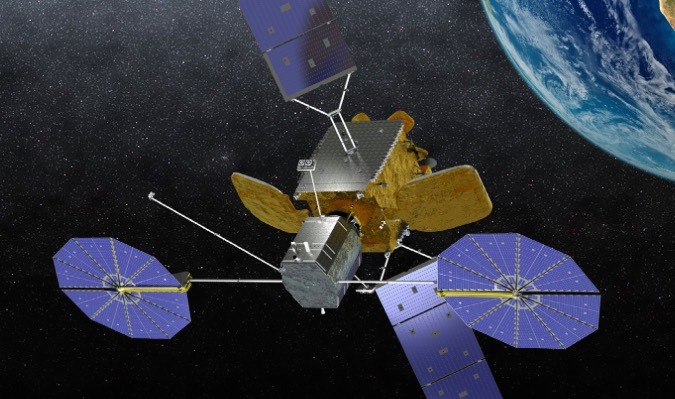 Sensing the promise of the satellite servicing concept, Orbital ATK executives identified the MEV as one of several major growth initiatives, committing to infuse the program with corporate funds to finish its development. “This program is a great example of the new revenue opportunities created by our merger,” said David Thompson, Orbital ATK’s president and CEO, in a conference call with investors earlier this year. The first MEV is entirely privately-funded, officials said, but Orbital ATK has government study contracts that could add features for later MEVs to replace payload packages or solar arrays on old satellites in orbit. 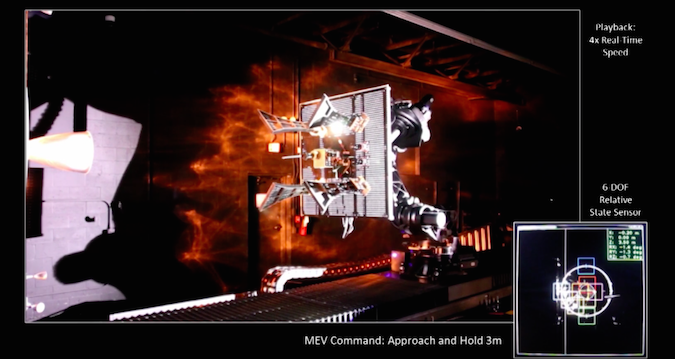 The MEV completed its first system design review in June, and Orbital ATK has placed orders for long-lead items for the first spacecraft. Thompson said in August that the schedule, cost and technical performance on the project are proceeding as planned, with launch on track for the fourth quarter of 2018 and the start of operations in early 2019. Assembly of the MEV will be at Orbital ATK’s main satellite factory in Dulles, Virginia. The key to making Orbital ATK’s satellite servicing concept realistic and affordable is that it does not require engineers to invent new technology, officials said. “If things proceed as planned, the first of an eventual fleet of up to five of these geosynchronous orbit servicing vehicles will commence operations following launch in early 2019 with four more such vehicles to follow in 2020 and 2021,” Thompson said. According to Wilson, follow-on MEVs could launch in pairs on Proton or Falcon 9 rockets. The MEV could also launch one at a time on Ariane 5 rockets, in tandem with a larger communications satellite. Orbital ATK is in talks with other commercial satellite operators and the U.S. government as potential customers for MEVs after Intelsat. Once its post-launch orbit-raising maneuvers are complete, MEV 1’s first destination will be a decommissioned, but still active, Intelsat satellite parked in a “graveyard” orbit several hundred miles above the geostationary belt. 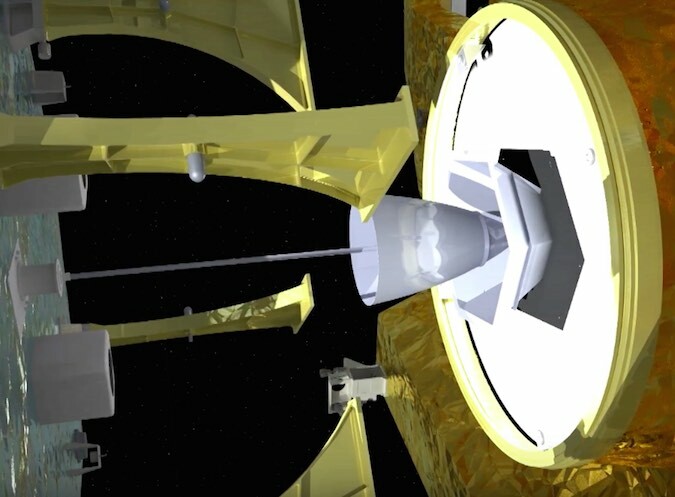 The Mission Extension Vehicle will approach the satellite, acquiring the target with its suite of optical and laser sensors to move in for an automated rendezvous. The MEV is different from other satellite servicing concepts because it is strictly used for steering, pointing and relocating another spacecraft that is running low on propellant. The servicer will not refuel Intelsat’s satellites, which were never designed for dockings. The Mission Extension Vehicle will latch on to the apogee kick motor of each client satellite, an engine mounted to the base of about 80 percent of the communications satellites in geosynchronous orbit. The thruster is only used in the first few weeks after launch to put the satellite into its final orbit, then never fired again. The approaching spacecraft will have a stinger that reaches into the apogee rocket engine’s nozzle from about 3 feet (1 meter) out, and mechanical fingers will reach out and grab the target craft to pull the two satellites together, Wilson said. A structural stanchion will carry the load between the two spacecraft. The MEV has two deployable propulsion pods with efficient electric thrusters, little engines that generate very low thrust but can operate for hours or days at a time. There is also a small tank of liquid hydrazine fuel on-board, mainly for higher-impulse maneuvers during the docking sequence. Once the satellites are docked, the MEV takes over attitude control and propulsion responsibilities, acting like a jet pack for the customer spacecraft. Under the terms of the Intelsat contract, MEV 1 could dock and undock with multiple Intelsat satellites over a five-year period, then move on to serve another customer. Each MEV has enough fuel to operate for 15-to-20 years, Wilson said. Intelsat has identified a few satellites that could use help from MEV 1, but officials do not plan to announce them until the mission is closer to launch, according to Ken Lee, Intelsat’s senior vice president of space systems. Intelsat has experience with satellite servicing before. Astronauts on the maiden flight of space shuttle Endeavour in 1992 attached a new rocket motor to the Intelsat 603 communications craft stranded in a low orbit by a launch failure, allowing the satellite to reach its operating post in geosynchronous orbit and relay television channels and telephone calls until it was retired in 2015. Intelsat was also a prospective customer for Canada’s MDA Corp., which scaled back its vision to refuel satellites in orbit. “We’re really excited about the capability,” Lee said of Orbital ATK’s Mission Extension Vehicle. “From our perspective, it’s one of the tools in our toolkit, so not all our satellites will have this business plan, but there are certain spacecraft that may suit well for this capability. Lee said there are more questions about the economic viability of satellite servicing than the technologies involved. “Our technical assessment of this capability is we don’t consider this to be high-risk,” Lee said. “The technology is there today, and in fact, using it in GEO (geosynchronous orbit) is a lot easier than using it in LEO (low Earth orbit) for a lot of reasons. We don’t view it as a huge technical challenge. I think the challenge here is with the business model. Wilson said Mission Extension Vehicle is a service-based business, with customers paying for a year of service at a time. In the current paradigm, satellite operators must order new satellites years before an existing satellite runs out of fuel or dies. Lee dismissed questions about the relevance of communications payloads aboard satellites that, in some cases, are 15 or more years old and launched before the arrival of smartphones and widespread broadband Internet. He pointed to operational members of Intelsat’s constellation, which has more than 50 active satellites, that have been in space for decades.